Want to put your organization’s name and products in front of the Southeast’s top entrepreneurs, small business owners, bloggers, new media pros, academia and people from across the spectrum of marketing, public relations, human resources and the executive ranks? Become a SoCon10 sponsor. 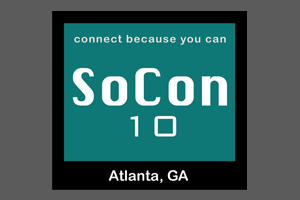 "Every year, we find that SoCon provides an excellent opportunity to network with speakers and attendees who are leading technology change in our industry. Its the quality of the people, many of whom we have initiated relationships with at the conference, that keeps us coming back."